Most of the city's house sparrows are puffing up their feathers and trying to keep warm, but not all of them. Click to enlarge. I take an express train to the 59th Street subway station where I can either go above ground and walk the rest of the way to the museum, or catch a local train. When the weather is bad, as it has been throughout February, I catch the local train and ride the rest of the way. 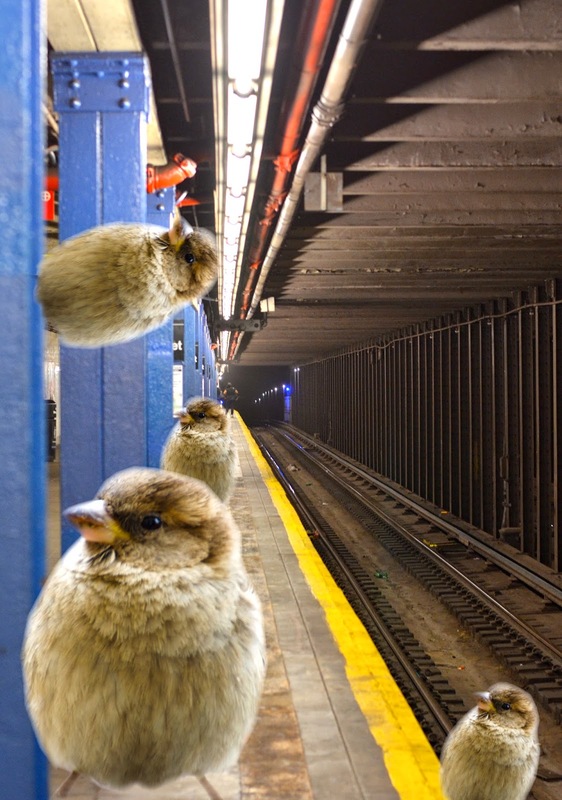 The 59th Street station is busy with commuters, the intersection of several train lines, newsstands, street performers, and ... birds. It's full of birds! One day last week the train doors opened and I was surrounded by the sound of chirping birds, so many chirping birds I could hear them over the din of the trains. I also heard some incongruously loud mariachi music. For a moment I was tricked into forgetting winter. I looked around and saw a flock of sparrows chirping in the rafters, some hopping on the platform, and a few more pulling a half-eaten danish from a trashcan. It was 7 degrees F above ground that day. Clever birds to fly down the stairs and away from all that! Further down the platform a man holding a microphone burst into a Mexican song. A passerby stopped to dance. The birds chirped and fluttered.